Note: These buildings were demolished in 2011-12. These buildings are hidden away behind York Art Gallery. Most people who have seen them think that they’re just a load of scruffy asbestos-ridden sheds. But they’re more interesting than that. I went searching for accurate facts after noticing a lot of contradictory information on the web and elsewhere. The info below was compiled from dusty old volumes of council minutes, and various other sources (full list at foot of page). 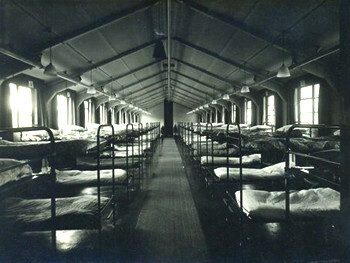 They were constructed as a service hostel or leave club by the RCAF (Royal Canadian Air Force). From 1981 the nearby Yorkshire Museum used the buildings for storage and workroom space. The buildings are ‘of prefab concrete frame construction with clay brick infill panels and asbestos sheet roofing’. 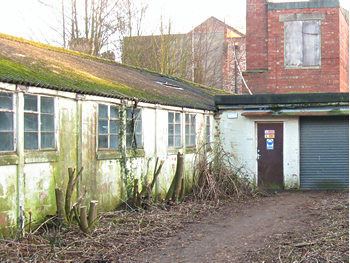 This is similar to buildings of the period in use at Eden Camp and the Yorkshire Air Museum. However the current planning application states that demolition is ‘required for health and safety reasons’. During 2011 they have been emptied in preparation for demolition. Despite the fact that so few people understand the significance of what’s about to be demolished – even the journalists from our local Press. It’s probably not feasible to keep the entire ‘hutments’ complex, but part of the structure should be retained on site. For more info and interior photos of the buildings in recent months, search for hutments York on Google. York City Council minutes; Annual Reports of the Yorkshire Philosophical Society; 17 Feb report prepared for CoYC meeting (PDF); documents submitted with the ‘big wheel’ planning application, eg this one and this one (PDF files); The history of the Yorkshire Museum and its geological collections, B J Pyrah (York, 1988); letter from Mr MacPherson of Ontario (held by the Yorkshire Air Museum) … and recent web-based photo galleries by urban explorers and ‘guerilla historians’ – thank you chaps, for showing us what we couldn’t get to see for ourselves. I can confirm that the first hut reached when walking from Exhibition Square down the side of the Art Gallery was in fact used by York School of Art. I was a Graphic Design Student between 1971 – 1974 and used ‘The Hut’ (as it was always called) for both Printmaking, and Photography lessons. On entering the Hut the first section was for printmaking and contained Litho presses and Screen Printing beds. There was then a partition wall dividing this section from a small Photography studio. Beyond this was a very small Darkroom. As an aside, I am still in contact with two of the lecturers that taught in the Hut, Roger Hallam and Chris Brace, both now retired. I still have many of the pictures I printed in that very dark room. Poor Roger, what a thankless task teaching us (me) that must have been! There was a canteen at the back too, wasn’t there? Hi, Paula I was there with you. I have a photo of myself stood alongside “The Hut” as I think we called it. Marygate college canteen was further back and Art School students were allowed to use it. At the moment there is an exhibition in the Art Gallery with former students’ and lecturers’ work. I got a massive hit of nostalgia stood in that room. Hi David. I was at the Art school a little before you, leaving in 1971, I remember the hut very well and the studio at the bag, even earned some pocket money as a model for the camera club with Yvonne Kalicinski. These were happy days, and please pass on my regards to Roger and Chris if you are still in contact – from Arthur. And very sad news about Sally Arnup, there are not many people for whom you can say that the World is a better place as a result of their work, Sally is one of the few. David, during your time at the school did you know of Dennis Donn? I believe that he was on the staff. Dennis Donn was the Principal when I was there, his wife was also a teacher, doing calligraphy from memory. When were you there? Thanks for your quick response. Yes I do remember Dennis Donn, he was principal during my time at York School of art. It was Mr Donn who interviewed me for a place on the Graphic Design Course in 1971. I believe that such was his control over the Art School that he initially interviewed everyone regardless of the course or pathway they required. Over my 3 years at Exhibition Square I had several meetings with Mr Donn who was a formidable but approachable figure who seemed to be held in high esteem by Staff and Students alike. He was very much of the ‘old school’ with high principals and would always back up a point or advice with an anecdote from his own vast experience. His physical appearance was also worthy of note. He had a long goatee beard, and regularly wore a black beret and army combat jacket. He reminded me very much of photographs of the artist Augustus John in later life. He could regularly be seen working on a large portrait painting of Mrs Donn in his office / studio, the door of which was always open at the top of the narrow wooden staircase. Every student, and the staff would have to pass this door to enter the studios, so he knew exactly what was going on and who was doing what at all times. I am myself now a lecturer in Graphic Design, and look back at my time at York School of Art in the early seventies with fond memories. These were the days when the only paperwork a lecturer had to do was a register and some marking, staff and students would regularly go to the pub and the many party’s together, and a full time course was 5 days a week and staff were able to spend their whole day teaching and discussing Art with the students! A very different (And better) world and education than today. Peter and David, I hope you’ve been able to make contact and discuss this further, following the exchange of email addresses. Mr Donn’s wife was called Winifred. She taught Graphic Design students Heraldry and Lettering. I studied graphics, advertising and design from 1974 to 1978. Hope this information isn’t coming too late. My grandmother worked at the hutments during World War II. She was head cook. The Canadians called her ‘Cookie’. We have a YMCA (Canada) brooch, white enamel on silver, in the shape of a maple leaf which we assume came from this time. So nice to read this Caroline, thank you. I’m going to email you. Would love to see a photo of the brooch you mention. There was a website on York School of Art, I linked to it on another page, compiled around the same time: http://yorkstories.co.uk/histories/york-school-of-art/. But at some point in the intervening five years that website has disappeared from the web – the domain name yorkartschool.co.uk leads to an online clothing store instead. Which is a bit strange. This seemed a shame so I’ve tried to follow it up, and found that the Internet Archive (marvellous resource that it is) has some record of the site, parts of it anyway – see this link for example, and this link. Those old pages do also contain a couple of contact email addresses, if anyone wants to follow it up and try to make contact with the person who compiled that site. If you do, I’d appreciate it if you could report back, so if there’s a new site or any further information I can update links etc. My mother, Margaret Werge, taught for some time at York. She also did a day a week at Scarborough teaching there too. This was back in the mid to late 1950’s. The name of Mr Donn was one she mentioned and many year later on a family visit to York, was I was a small kid, we bumped into him. That will have been the 1970’s. Did she teach etching and printing by any chance John, and lived in Leeds? My name is Andrew Hepworth. I originally did a diploma in art and design at Harrogate art college and then moved to York Art college in the late 70s/early 80s to do a higher diploma in Graphic Design as well as a CSD course in graphic design. I remember Roger Hallam (with beard and black jacket). Do you have any pics or contacts from that time? I remember some one or two students – Gillian Wheelwright, Sally Breaks, a guy who used to drive an old MG and a great typography teacher but can’t remember his name…would be greatfull for any feedback. I ended up working in advertising in Singapore and still living here – great to hear from anyone.